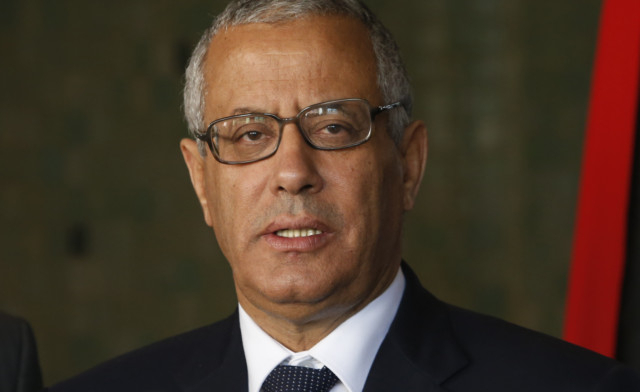 Tripoli: Gunmen seized Prime Minister Ali Zaidan from a Tripoli hotel early on Thursday, in the latest sign of the lawlessness sweeping Libya since dictator Muammar Gaddafi was toppled in 2011. The pre-dawn abduction comes five days after US commandos embarrassed and angered Libya’s government by capturing senior Al Qaida suspect Abu Anas Al Libi off the streets of Tripoli and whisking him away to a warship. “The head of the transitional government, Ali Zaidan, was taken to an unknown destination for unknown reasons by a group” of men believed to be former rebels, the government said in a brief statement on its website. A source in the premier’s office said Zaidan had been taken from Tripoli’s Corinthia Hotel, where he resides. “A large number of armed men entered the place very early on Thursday. But we did not know what was happening,” a hotel employee said, speaking on condition of anonymity. A group of former rebels, which had roundly denounced Al Libi’s abduction and blamed Zaidan’s government for it, said it had “arrested” Zaidan. The premier “was arrested under the Libyan penal code... on the instructions of the public prosecutor,” the group said. It said he was detained for “crimes and offences prejudicial to the state” and its security. The cabinet said on its Facebook page that ministers were “unaware of immunity being lifted or of any arrest warrant” for the prime minister. The Operations Cell of Libyan Revolutionaries had expressed outrage at the brazen daylight raid by US commandos to capture Al Libi. It said on Tuesday it had told its fighters to be prepared for orders to “hunt down and expel foreigners who are illegally in the country”. It added that it was on high alert “in light of the deterioration in security and damage to the country’s sovereignty by foreign intelligence bodies”. Two years after the revolution that toppled Gaddafi, the country’s new authorities are struggling to rein in tribal militias and groups of former rebels who spearheaded the uprising. Thursday’s government statement said it suspected two groups of ex-rebels, the Operations Cell of Libyan Revolutionaries and the Brigade for the Fight against Crime, of being behind the abduction. The cabinet and the General National Congress, Libya’s top political authority, were dealing with the situation, the statement said, while calling on citizens to remain calm. US State Department spokeswoman Jennifer Psaki, travelling with Secretary of State John Kerry in Brunei, said Washington was seeking more information on the reported kidnapping. “We are looking into these reports and we are in close touch with senior US and Libyan officials on the ground,” she told reporters. Zaidan, who was named prime minister a year ago, had on Tuesday condemned the US raid and insisted that all Libyans should be tried on home soil. The General National Congress has demanded that Washington “immediately” hand back Al Libi, claiming his capture was a flagrant violation of Libyan sovereignty. Al Libi — real name Nazih Abdul Hamed Al Raghie — was on the FBI’s most wanted list with a $5million (Dh18.36 million) bounty on his head for his alleged role in the 1998 twin bombings of two US embassies in East Africa. He is reportedly being held aboard a US Navy ship in the Mediterranean. US President Barack Obama said on Tuesday Al Libi was involved in plots that killed hundreds of people and he will be brought to justice. Many Libyans blame political rivalries for the problems plaguing a country awash with militias and weaponry left over from the 2011 revolution that toppled Gaddafi. Public anger is growing as widespread violence including political assassinations proliferates, particularly in the east of the country.